As we have seen in previous sections, one of the main consequences of a nuclear explosion happening at or near ground level is that millions of tons of dust and debris would be thrown up into the atmosphere. The largest chunks would relatively quickly fall back to the ground—being thrown perhaps at most a few tens of miles away from ground zero. Even the majority of the smaller pieces would come back down within about a day after the blast. Actually, it has been estimated that about 70% of the debris kicked up by a nuclear explosion would fall downwind within only 24 hours of the blast. However, the tiniest of dust particles, smoke, and pulverized debris from these blasts would constitute the most dangerous part of this nuclear fallout, as they would be taken up into the atmosphere and then be blown around the Earth with the prevailing wind currents. If any bomb generated such huge particulate fallout it would constitute an immense danger to people within range. However, with nuclear explosions an additional factor present is the extreme hazard of radioactivity, which originally would come from the unstable uranium or plutonium in the bomb’s core or from radioactive elements generated in the fission or fusion chain reaction. These radioactive elements would then be carried aloft and spread out along with all the other debris. When a thermonuclear device explodes, two significant radioactive elements are produced (strontium-90 and cesium-137) which get mixed in with the dust and rubble. These isotopes each have a half-life of several decades and will thus contaminate a large area for many years after the initial explosion. In addition, any leftover fissionable material (U-235 or Pu-239) would also be dispersed in the clouds of smoke and dust and contribute to large amounts of radioactivity. For a one-megaton bomb, the fallout from just the first 24 hours after the blast would contaminate at least 1,000 square miles with highly radioactive dust and debris. If the warhead happened to detonate near a nuclear power plant, a very common target of military strategists, then the additional radioactivity could increase the contaminated area by many orders of magnitude and produce radiation of much greater longevity. From a limited war involving only one-third of the present nuclear arsenals, scientists have estimated that up to 225 billion tons of radioactive debris would be carried aloft through the atmosphere (from: The Final Epidemic for all Living Things, by The Physicians for Social Responsibility, 1982). Radiation from this kind of fallout comes in two lethal forms—gamma rays and beta particles. Gamma radiation is ultra high frequency electromagnetic energy that is even more dangerous than x-rays and which can penetrate directly through living organisms. Gamma rays are among the most energetic and dangerous light waves in the universe and can kill at a distance. This form of radiation will be the first reason for most of the deaths and sickness from the immediate fallout. Beta particles, by contrast, are energetic electrons that are thrown out of the decaying nuclei of the radioactive elements. They do most of their damage at close range such as when fallout accumulates on plants and skin or is eaten. Note that these forms of radiation from nuclear fallout are in addition to the intense neutron radiation that is produced at the time of each nuclear blast; however, the neutron radiation dissipates within minutes of an explosion, but the other forms of radiation due to fallout last for years. So incredibly dangerous is the potential of radioactive fallout that in fact the long-term cumulative effects of lethal radiation would far exceed the immediate blast effects of the exploding bombs. Fallout would be absorbed on skin, clothing, and plants, while the finest dust particles could be breathed in to cause internal damage to tissue. Even in a limited attack, the resultant radioactivity would quickly get into the food chain and contaminate the food supply of every organism up to man. For those “unlucky” enough to survive the initial nuclear blasts, they would be presented with a world of suffering, which was slowly dying from an unseen, but deadly danger. “The first symptoms are vomiting and diarrhea, followed by anemia, loss of hair, possible skin sores, increased susceptibility to infection, and finally—in the worst cases—death” (from Nuclear War; What’s in it for You?, by Ground Zero, 1982, p. 140, Pocket Books). “And there came out of the smoke locusts upon the earth, and unto them was given power, as the scorpions of the earth have power. “And it was commanded them that they should not hurt the grass of the earth, neither any tree, but only those men who have not the seal of God in their foreheads. “And to them it was given that they should not kill them, but that they should be tormented five months; and their torment was like the torment of a scorpion, when he striketh a man. Like many of the other prophecies about the tremendous destructive effects of the end, this vision has been almost exclusively interpreted as being a supernaturally caused phenomenon. If the passage was to be treated only in this way, then we would have to believe that the Lord is actually going to create these mutant locusts and send them upon the ungodly in the last days. However, John goes on to describe the appearance of these creatures in terms that make them sound more like symbolic descriptions of human warriors than literal insects (see Rev. 9:7-9). If we treat this prophecy, not as representing some weird, divinely created, mutant creatures, but rather as a description of one of the principle effects of the global military battles of the end—battles caused by man—then suddenly the prediction begins to make sense. Could it be that the Bible is trying to tell us that out of the dark mushroom clouds, smoke, and fallout of a nuclear holocaust will come the stinging scorpions of radioactivity? It has often been said that the survivors of World War III would envy the dead. The slow, agonizing bodily decay caused by radiation sickness will make everyone affected wish for the relief of death. The prophecy says that for a period of five months men shall hope for death, but death will not come. Notice, the Bible does not say that there will be a period of five months completely devoid of death on the Earth. It only predicts that those people affected by these “locusts” will suffer on the edge of death for that time period. “In the weeks after the bombing, many survivors began to notice the appearance of petechiae—small spots caused by hemorrhages—on their skin. These usually signaled the onset of the critical stage of radiation sickness. In the first stage, the victims characteristically vomited repeatedly, ran a fever, and developed an abnormal thirst. (The cry ‘Water! Water!’ was one of the few sounds often heard in Hiroshima on the day of the bombing.) Then, after a few hours or days, there was a deceptively hopeful period of remission of symptoms, called the latency period, which lasted from about a week to about four weeks… During the latency period, the count of white blood cells, which are instrumental in fighting infections, and the count of platelets, which are instrumental in clotting, drop precipitously, so the body is poorly defended against infection and is liable to hemorrhaging. In the third, and final, stage, which may last for several weeks, the victim’s hair may fall out and he may suffer from diarrhea and may bleed from the intestines, the mouth, or other parts of the body, and in the end he will either recover or die” (Fate of the Earth, Schell, p. 43-44). This description perfectly follows the known effects of radiation sickness. The characteristic petechiae sores will develop upon millions of survivors within the once-proud empire of the Antichrist. From out of the dark and foreboding clouds of atomic death will come a hell on earth the likes of which man has never before experienced. It is also interesting that the prophecy of the locusts predicts that they will not hurt insects or plant life (Rev. 9:4). Since literal locusts eat plants with ferocious appetites, this statement is a further indication that the insects must be symbolic representations of something else. It just so happens that the most tolerant of all living things toward radiation are insects and plants. While the Bible does predict that the fires started by the nuclear exchange will devastate much of the green growth in the areas of the attack, plants happen to survive much more readily than animals when exposed to the subsequent radioactivity. Jonathon Schell points out, however, that “large plants are more vulnerable to radiation than small ones.” He also adds, “trees are among the first to die, grasses among the last” (Fate of the Earth, Schell, p. 63). If a large-scale nuclear exchange was to occur in which a significant percentage of the present nuclear arsenals were used, most if not all plant life would be threatened. Therefore, we must conclude that at least the initial nuclear exchange as predicted in the Bible, while certainly being beyond imagination with respect to its destructiveness, will nevertheless have to be somewhat limited to allow plants to survive. Though huge areas of the earth are prophesied to be affected and upwards of a quarter of the world’s population killed, that will still, at least at first, not be enough to threaten the survival of all life. As we will soon discover, however, by the time of the attack of the Kings of the East at the very end of the war, conditions will so worsen that complete extinction will become a very real possibility. No matter what terrible things may come to pass in this life, as followers of Christ we should always remember that we are ultimately headed toward a resurrection and a new heavens and a new Earth, where peace and righteousness will dwell forever. Though the immediate future may look dark and ominous because of an evil world, the ones who follow Jesus are promised the brightest of all destinies imaginable (see the Kingdom Age). As the last 3-1/2 years of the Great Tribulation progress to an end, the wars will grow in number of participants and ferocity. Nuclear weapons are predicted in at least two major offensives—in the attack of Russia and later in the attack of China. The initial exchange between the Western Alliance and the Russian bloc will leave the world reeling from forces it never before experienced. After this first holocaust begins to subside, however, subsequent uses of nuclear arms will only bring the ecosystem all that much closer to the brink of total collapse. Instead of being allowed to recover from the initial barrage, the Earth and its inhabitants will be subjected to continued assaults that will threaten the very survival of both plant and animal life. However, radioactive fallout is just one of the long-term dangers. Out of the mushroom clouds will also come very fine particles of dust, which will not readily settle with the initial fallout. Huge clouds of smoke will further accompany these particles as the cities, forests, and grasslands of the world burn. It has only recently become clear how significant a factor these dust clouds will be in the post-holocaust world. In December 1983, the prestigious journal Science published an article on the global consequences of nuclear war (Science, vol. 222, p. 1283). Called the TTAPS study after the initials of its authors, it presented a radical new view on the aftereffects of a full-scale nuclear exchange. The authors used computer modeling to investigate the atmospheric and climatic changes that would take place if a relatively moderate 5000-megaton war was to be waged. Even though this level represents less than the combined total of all the existing nuclear stockpiles, the calculated effect on the world proved to be almost unbelievable. 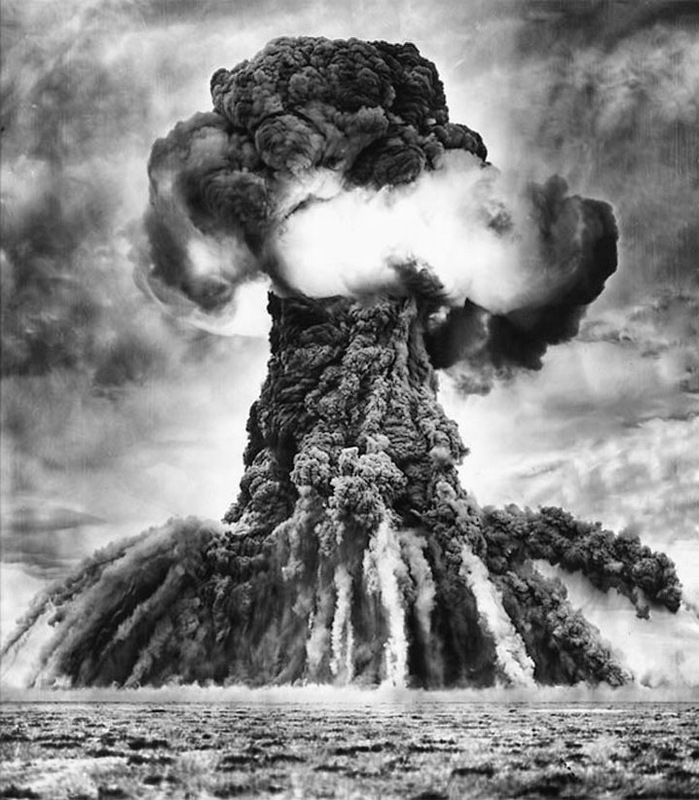 The TTAPS study found that shortly after the bombs were dropped “thousands of individual dust and smoke clouds would be distributed throughout the northern mid-latitudes and at altitudes up to 30 kilometers”. They went on to say that “horizontal turbulent diffusion, vertical wind shear, and continuing smoke emission could spread the clouds of nuclear debris over the entire zone, and tend to fill in any holes in the clouds, within 1 to 2 weeks” (Science, vol. 222, p. 1284). In other words, within only a few weeks after the initial fireballs, blast waves, and radioactive fallout have decimated civilization, the resulting soot, smoke, and dust would totally cover the sky in a thick cloud of blackness (see: http://www.nucleardarkness.org/web/whatisnucleardarkness/ for an animation of this effect following a U.S. – Russian exchange). This cloud would dissipate only very slowly, leaving the world, especially the Northern Hemisphere, in a gloomy, sunless environment perhaps for as long as a year. Since the amount of sunlight penetrating the atmosphere would be reduced to only a fraction of what it was before the nuclear exchange, the TTAPS study calculated that the average world temperature could drop precipitously. Therefore, what might result from even a brief, limited exchange between Russia and the West is a devastating global “nuclear winter” which could hold the survivors in a virtual deep freeze that would persist even through the summer months. According to the results of the study, ambient temperatures could drop almost overnight, reaching -15° to -25° C (5° to -13° F) and staying there until the clouds of dust cleared. The amount of sunlight reaching the ground could also be reduced so severely that plants would have trouble engaging in photosynthesis. In other words, crops and plants left unharmed by the initial bombs and fires might die anyway simply because of the darkened conditions. “…the extinction of a large fraction of the Earth’s animals, plants, and microorganisms seems possible. The population size of Homo sapiens conceivably could be reduced to prehistoric levels or below, and extinction of the human species itself cannot be excluded” (Science, vol. 222, p. 1293). More recent analysis shows that even a limited nuclear conflict between Third World nations, such as India and Pakistan, would also have devastating worldwide climatic effects and result in dramatic reductions in average temperatures due to reduced sunlight. Robock et al. published in the journal Atmospheric Chemistry and Physics in 2007 (vol. 7, pp 2003-2012) that the nuclear blasts and fires resulting from the use of only 100 Hiroshima-sized nuclear weapons would spread thick clouds of darkness around the globe in just a few months. Unlike the TTAPS study, however, this analysis found that much more smoke would be injected into the upper atmosphere due to the strong stratospheric plume rise from the nuclear blasts. For this reason, even a limited nuclear exchange would have devastating consequences and result in global temperature reductions that would last for years. The apostle predicts a time of darkness where one-third of the light shining from the sun, moon, and stars will be obscured. This darkness is prophesied to come only after the fireballs of the first three trumpets occur—or in precisely the same order of events predicted by a scientific knowledge of the effects of nuclear weapons! The allusion to a blood-colored moon may have reference to the high stratospheric dust particles lending a reddish tint to any light coming through the air, an effect known to be common even with small quantities of dust in the atmosphere. “The great day of the Lord is near, it is near, and hasteneth greatly, even the voice of the day of the Lord; the mighty man shall cry there bitterly. The day of judgment is coming upon the world, and we would do well to consider this seriously. If you have never believed in the Bible or God before, but you can see the truth of God in prophecy, then it is time to Escape to Safety before it is too late!